Walk into any office or public building and you might not immediately notice the topdressing chosen for surrounding plants. A lot of planning goes into details like topdressing, the staging material that covers the soil surface of any potted plant. Most plantscapes incorporate this staging material into an overall design. It’s an entirely different process when you are working indoors than when you’re gardening outside. Many products meant to be applied outdoors can come with odors, allergens, attract new pests or can even be a fire hazard. It’s just not as simple as pouring on the mulch when working indoors. Like any other office dress code, the right choices in topdressing can make a real difference. Topdressing has the ability to impact what kind of statement it can make in an indoor office environment. From the clean look of stone to the pop-of-color provided by moss and longevity of preserved moss, each variety of topsoil is carefully considered for its location and brand. Topdressing options can include: river rock, crush slate, replica coverings, moss, crushed glass, hardwood mulch and more. Given the plethora of options, it’s best to work with an expert to choose your office plant topdressing wisely. That’s where Planterra horticulture experts can help you plan. River Rock: One of the sleekest topdressings and most popular options at Planterra is river rock. 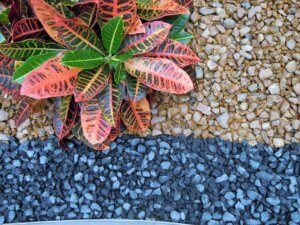 Think beautifully polished stones to highlight your plant and container choices while providing the proper water drainage for your installation. From Tiger Eye to black river rock stones, the topdressing makes a statement. For plants that spend a lot of time in the sun, we would warn against black river rock, which can heat up the soil and hurt the plant. Poly-Pebbles: Go eco-friendly with poly-pebbles. These recycled plastic materials emulate polished stones and come in three different shades: Black, Grey, and White Pearl. They are a cost-effective alternative to natural river rock that still looks very natural and can accent any setting. Spanish Gray Moss- By far the most popular top dressing, Spanish moss is a standard option for our plant installations. Due to allergen concerns, Planterra only uses replica Spanish moss. Preserved Moss- Preserved moss option still offers a natural look but it won’t fade over time. It can maintain its aesthetic integrity for up to 3 years. Reindeer Moss- This vibrant option comes in a wide array of green shades. While it may fade over time, it can be touched up with natural color and will certainly call attention to any plant. Crushed Glass: The plantscaping industry is embracing a new trend in crushed glass topdressing. Coming in a variety of colors – from cobalt blue to crushed transparent glass - these tumbled and soft-edged glass stones can set the tone of your installation, making the overall look as whimsical or classically elegant as you’d like. Planterra botanical stylists work with your vision to incorporate more color options best suited to your needs. Replica Plants: Try using other plants as topdressing to a larger plant. We often provide replica plantoptions for these scenarios. Combining succulents, grasses or draping foliage can increase the visual impact of any installation in your office setting. Mixing these elements can offer even more creative options when it comes to finding the right topdressing for your plantscape. Remember, any of these substances will degrade over time. Topdressing will need to be replaced regularly to be properly maintained. Find out how we can help you create a signature look meant to last in your office. Contact our experts at Planterra.